Good Morning Everyone, We just wanted to say Thank you all so much for an Awesome Release. We hope you are all enjoying your Stamps! Just wanted to let you know that our Designers are already hard at work with our next Release. I know you are all waiting for our winners so here you go. Great Turn out on our Challenge this month, lots of Awesome Entries but we can only have 1 winner. 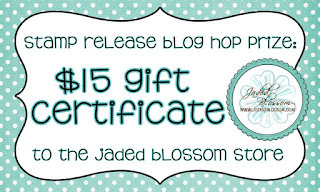 You have 2 weeks to contact us at admin@jadedblossom.com for your prizes. yay!!! congrats to all the winners!! Congrats to the other winners and I sent an email.